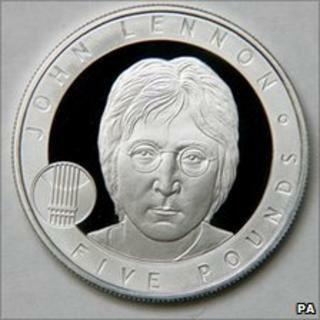 A commemorative £5 John Lennon coin has gone on sale only weeks after what would have been his 70th birthday. Lennon won the Royal Mint's public vote for the next "Great Briton" to be immortalised on a limited edition coin. Other names on the shortlist were Jane Austen and John Logie Baird. The Beatles singer, assassinated in 1980, now joins William Shakespeare, Sir Winston Churchill, Charles Darwin and Florence Nightingale in the series. The coin is priced at £44.99. Lennon fans launched Facebook and Twitter campaigns to ensure the Liverpudlian legend came out on top. A total of 27,874 people - 92% of those who voted - nominated Lennon for the £5 coin. Only 5,000 of the coins, issued as Alderney tender, have been minted. A one-off 24-carat gold version of the coin will be given to the John Lennon Estate. Dave Knight, director of commemorative coin at the Royal Mint, said: "It's entirely fitting that John Lennon has been chosen by the public in what would have been his 70th year. "The massive proportion of the vote he received shows clearly just how much his untimely death still resonates with the nation. "He ranks alongside, and even ahead of, some of the greatest names in history and the Royal Mint is proud to commemorate a genuine British legend."